This place is a mix of busy alleys, shady lanes, pools filled with water lilies and lotus flowers, vibrant colours against ochre hues and an endless source of inspiration. Whether you hear the prayers from the mosque or the scents wafting through the air, laden with sugared fragrance, Marrakesh takes you into another dreamy world, which enlightens your senses. Read more. Book a table for an early dinner to catch the golden light of the city before sunset and enjoy the mix of Moroccan food with European influences. Breakfast and cocktails at their rooftop bar & restaurant are also a good idea, especially for their homemade croissants and breads. I love the idea of this restaurant. You enter through a shop and then choose the floor where you want to sit. My favourite is the rooftop where I especially love to enjoy their appetizers. No drinks are served but the Moroccan version of Affogato is a dream. 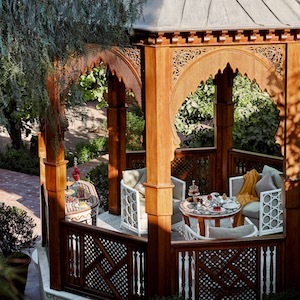 Book a teatime or lunch at the spa garden of the Royal Mansour hotel and relax in a lush garden with the tastiest healthy food I found in town. 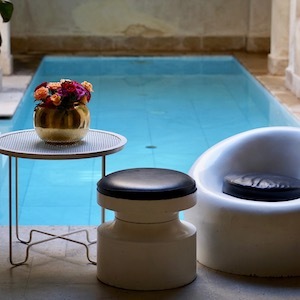 You could book a hamam treatment before or just lounge by the pool for a siesta afterwards. 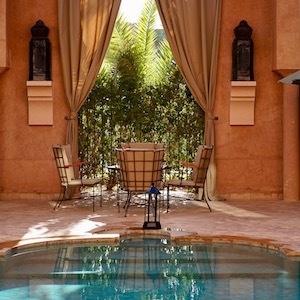 I would call this a version of modern paradise with private luxury riads in a beautifully designed garden that lets you relax just a 15-minute drive from the busy Medina. The interior and garden design of the Villas actually do not want to make you leave the hotel to explore the city. It is truly candy for the eye. 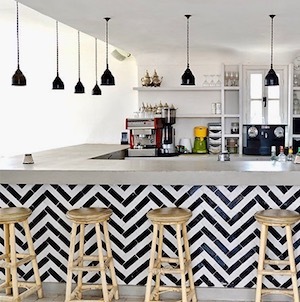 This cool boutique hotel is a great inspiration for you if you are searching for the modern Moroccan style. 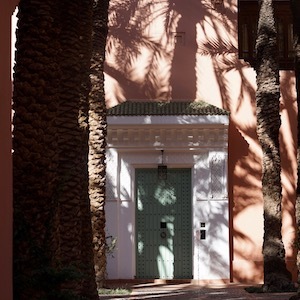 Every corner has mid-century furniture and pieces mixed with traditional Moroccan handicraft and carpets, and the flower bouquets and garden throughout the hotel inspire you to draw, write, sing and dance. The Jardin Majorelle is a little Garden Eden. 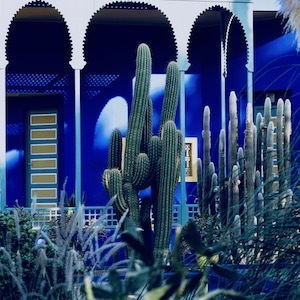 It took French painter Jacques Majorelle (1886–1962) forty years of passion and dedication to create this enchanting garden in the heart of the “Ochre City”. Come early, stroll around and be taken by the beauty nature has to offer. 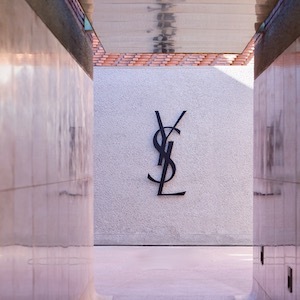 Built by Studio KO architects, the Saint Laurent Museum in Marrakech is designed to reflect the vibe of the designer’s work. 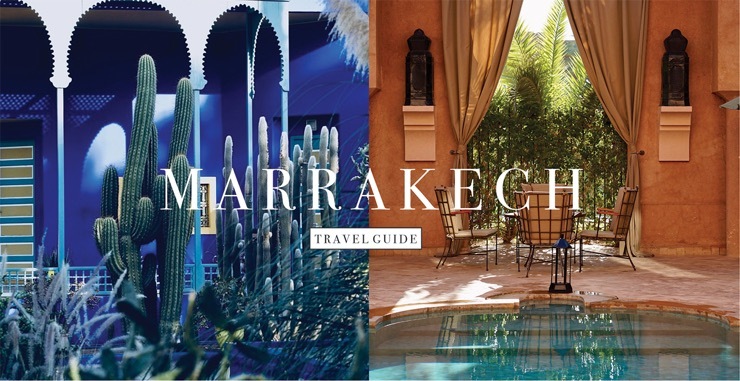 It features Moroccan stone and architecture that lends itself to the hot climate. The iconic logo, designed by Adolphe Mouron Cassandre in 1961, leaves no doubt about the focus of this museum. This hotel was handcrafted by over 1,500 artisans; today staff navigate one kilometre’s worth of tunnels beneath the lavish property so that service is unrivalled, intuitive and barely seen by guests. Spend a day by the pool and rent your own pool villa or just enjoy a tea in their magnificent lobby. 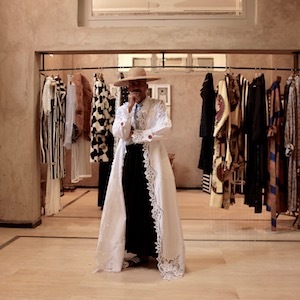 Artsi Ifrach, the owner and designer of Maison ARTC, takes vintage garments, materials and accessories and creates his own collections which differ from each other every time. If you are looking for a unique kaftan and you are bored with the things you see at the souk, you will find it at Maison ARTC. 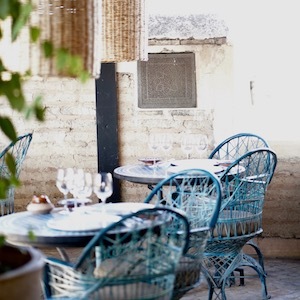 This version of a concept store in the middle of the Jardin Majorelle is one of a kind. 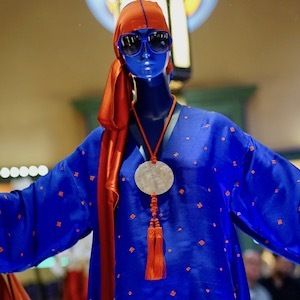 You will find limited-edition prints by Yves Saint Laurent, Moroccan-inspired haute couture pieces, jewellery, kaftans and foulards. 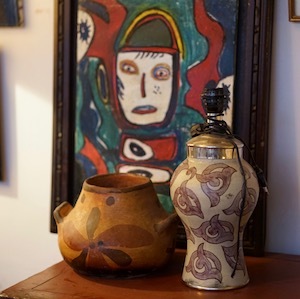 Set outside the bustling souks, just down the road from the Dar El Bacha (which handily serves as a taxi pick-up/drop-off point), Blaoui is a well-known interior shop for all kinds of traditional Moroccan interior finds: carpets, ceramics, furnitures and glassware – you will be in heaven.